Calendarwizard’s mid year photo diaries and calendars make the perfect gift this Father's Day – particularly if your other half struggles to remember family birthdays and anniversaries! As well as including up to 13 photos, you can add free printed personal dates – so no more excuses for forgetting! 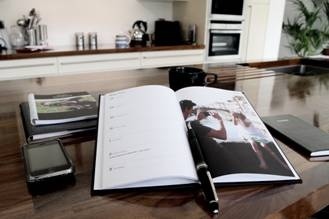 Start his diary in June 2012 and share your most cherished memories every month with a different printed photo. Calendarwizard offer a range of sophisticated designs so you can create a beautiful and useful photo gift this Father's Day. Simply upload your photos, add your dates and order. Your diary or calendar will be dispatched within 5 working days. Don’t forget FREE P&P with code 280509 entered at your basket. So what are you waiting for! Order your Father's Day photo diary and get him organized for 2012 now. Last order dates for guaranteed Father’s Day delivery is 11th June. Photo Diaries are available from Calendarwizard from £12.99.